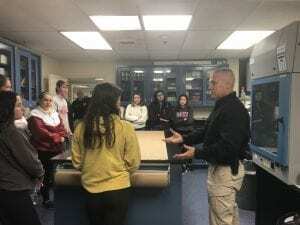 Last week, Tappan Zee High School Forensic Science students toured the Rockland County Sheriff’s Department Crime Lab and Medical Examiner’s Office, where they learned about tools and techniques used by professionals to investigate crimes. Brittney W. agreed. 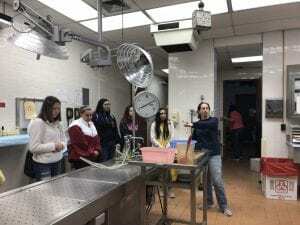 “I like the law enforcement side of things and hope to major in criminal justice in college,” said the junior, noting that she observed more women working in the Medical Examiner’s Office than the Sheriff’s Department during the class visit. Paris K. is taking Forensic Science because she hopes to pursue a career in the field. “I like the idea that I can help families get closure and get justice,” she says. Ms. Driscoll and her students expressed their thanks to Rockland County Office of the Medical Examiner Senior Medical Investigator Jaclyn MacIsaac, D-ABMDI and Rockland County Sheriff’s Office Police Division Chief William Barbera for speaking to their class and coordinating the Sheriff’s Office field trip.